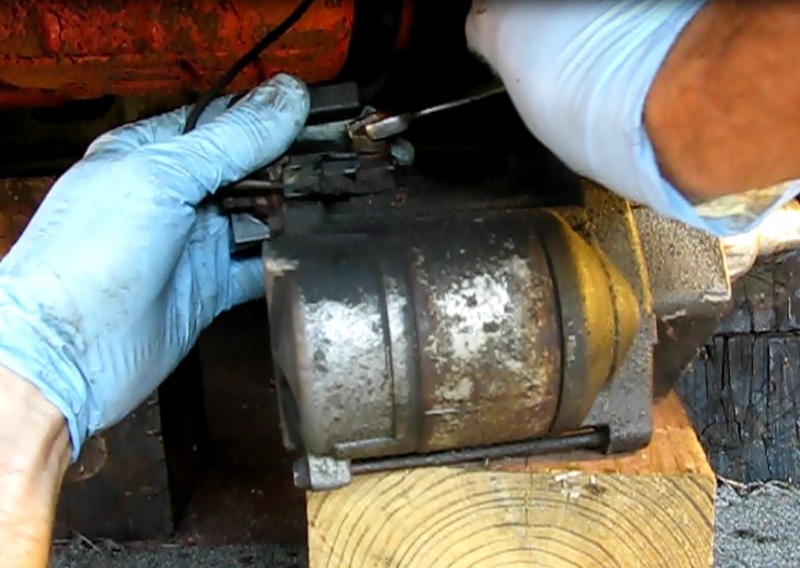 This post covers removing and installing the starter from a 2000 3.0L Dodge Caravan. Also included is a section on basic starter troubleshooting and re-installation. This is not a difficult repair. Although when a starter fails it is often necessary to tow the vehicle or perform the repair on the spot, jacking it up and working safely under it makes the job easier. Tools: Hydraulic or other jack, Jack stands or substantial wood supports, 10mm wrench, 15mm 3/8 drive socket and ratchet, 15mm box end wrench, small flat blade screwdriver, 12mm wrench, wood block. Parts and materials: Replacement starter. See below the post for parts. Shop labor cost for the job: $60-100. 1) Set parking brake, chock back wheel and jack up and support front end. 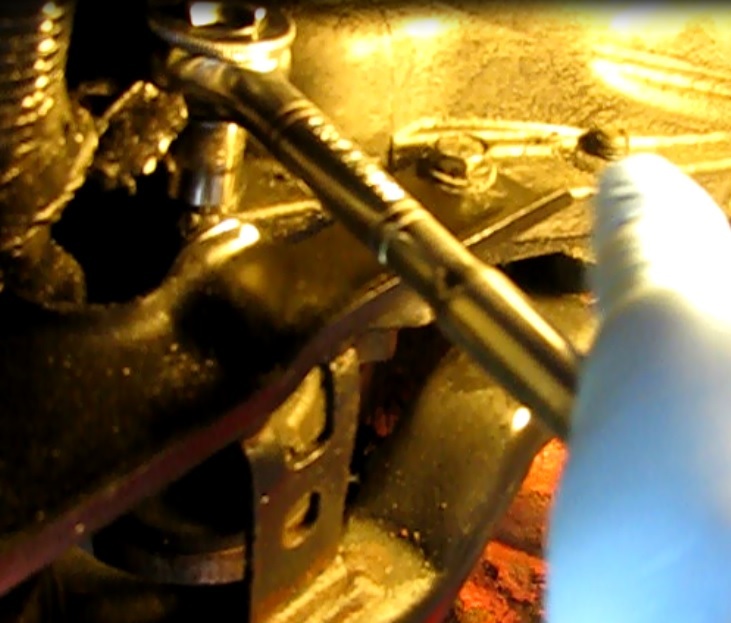 3) Unbolt the starter (located right near the oil filter) with a 15mm wrench or socket. Use a 3/8 ratchet to break them free and then go to a wrench or even better a ratcheting wrench. **Do Not remove the starter B+ nut. This is not the actual mounting point of the B+ to the starter. It is only the end of a lug that mounts further in. 4) Hold the starter with one hand and turn out the last, upper bolt with the other. Then set it down on a block of wood still connected to the wiring. 5) Remove a black cap to reveal a 12mm nut holding the red B+ wire to the starter. Tap the wrench with a hammer to break it loose.Turn off the nut. 4) Remove the spade connector holding the solenoid start wire. A small straight blade screwdriver will get the job done. 1) Set the new motor on the wood block and hook up the B+ with a 12mm wrench. Snap the plastic cap back over the connection. 2) Plug in the solenoid wire. 3) Remount the starter, jostling a bit till the pinion gear meshes with the flywheel. Start the easier lower 15mm bolt and work back and forth till all three are seated. Torque up. I could find no specs for this but it isn't a critical torquing operation. Good and snug will do. 5) Remove the stands and set the van back down. Thanks for using the post and I really appreciate the comment. Your starter went out and you want to replace it: Here's what to do. First you need to get the old starter out. Sometimes it's easy and sometimes not. The only reason it might be difficult is if it's located in a weird place.